In order to comply with current gas safety regulations, LANDLORDS, ESTATE / LETTING AGENCIES are required to administer annual gas safety inspections ensuring the safety of their tenants and property. Gas appliance manufacturers also recommend HOME OWNERS / BUYERS have an annual safety inspection to ensure safety and peace of mind. London Gas Inspections meets these needs by carrying out a thorough GasSafety Inspection of all relevant appliances and pipework in the property. A Certificate detailing the inspections findings is presented as a record. There is no additional cost to the prices shown above. This means No hidden charges for VAT, parking fees, multiple gas appliances etc. By specialising in Gas Safety Inspections we are able to offer these extremely competitive prices. Contact Us to arrange an inspection or to discuss your gas safety needs. What happens at a Gas Safety Inspection? 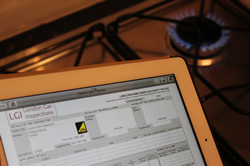 Carry out a thorough inspection of all gas appliances in the property. Check and test the flues. Ensure that the air ventilation is correct. Carry out a gas ‘tightness’ test at the meter to make sure that your proper ty has no leaks. Issuing of a gas safety certificate... printed on site with the option of PDF versi ons available via email. Testing of any carbon monoxide alarms in the property. On completion our engineer will explain what work has been carried out and ask for a signature on the gas safetycertificate. Following the inspection is any remedial work is required then our engineer will advise how to proceed. A gas safety inspection generally takes anything between 20-40 minutes, depending on the number of appliances in the property. However it may be wise to allow 60 minutes in your schedule.